There were three more Dinnis children to be baptised at the Brighton Chapel Royal: Charlotte, George and Cora. 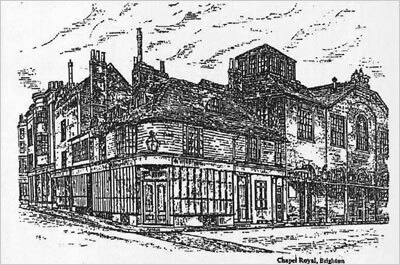 At this time the family had moved to Ship Street in Brighton, still very close to the Brighton Chapel Royal in the town centre. Their father, John Dinnis was still working as a Cook. I was very surprised to see George and Cora baptised on the same day, this was the first mention of Cora to me. George is my great grandfather, and he had a twin sister, Cora. This entry was posted in Charlotte Harriet Dinnis, Cora Dinnis, George Dinnis, John Dinnis and tagged Brighton. Bookmark the permalink. Oh, that’s an exciting discovery!